For any enquiries please give us a call on 01395 277337 or, complete the form below. 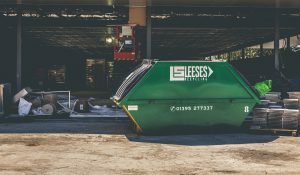 Charlie and Anne Leese founded Leese’s Skip Hire in 1969 to provide waste management services to the Exmouth area. Their family values of caring, reliability and respect extended to their customers who loyally supported Charlie and Anne and helped the business to flourish. With 40 vehicles on the road, Leeses serviced key projects including the M5 junction and many construction sites across Exmouth. Nowadays, Leeses Ltd continues to go from strength to strength, building upon its family values that are intrinsically linked to the brand. Leeses is part of the Devon Waste Mangement group of companies. © Leeses 2019. All Rights Reserved.